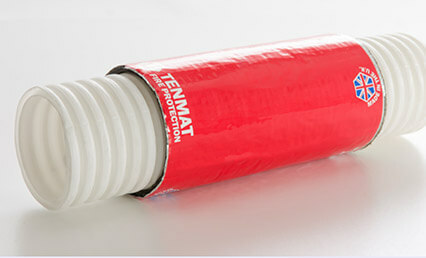 The TENMAT FIREFLY OverSleeve is a universal, one-product-fits-all solution for the fire stopping of cable bundles and cable conduits. The thin and flexible intumescent is quickly and simply wrapped directly onto the conduit. The red branded foil can be easily checked and identified on site to confirm that fire stopping is in place. The unique FIREFLY intumescent material rapidly expands to crush and seal off the conduit to provide up to 600 minutes fire resistance. Firefly OverSleeve Plus is available in 5m lengths – 2 x 180 x 1000 mm, plus repair tape.